In our experiences, the LPC-40L typically has the following parts failures: keypads, battery, power issues. 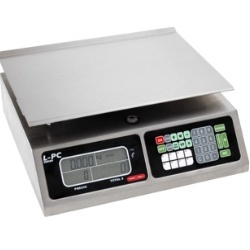 When we have one of these scales come in for repair, it is usually either a battery or keypad issue. Every so often it will be something to do with the power, either the AC adapter or the plug where the power adapter plugs in has come loose. Now the repair costs for something like that can range anywhere from around $25 to $100 including the labor. So if the repair is around $100 you have to decide if it’s worth repairing the scale or just spending a little more money and buying a new scale. The weighing platter is a little awkward and high compared to most similar scales. This is fairly common on all Torrey counter top scales. If you need to weigh items in a different unit other than pounds, it can be tricky to change the weight units. But, our real issue with Torrey is the manufacturer itself. This is one big reason we stopped promoting their product. Several years ago our main point of contact left the company and once that happened, the replacement person had no interest in working with us on any issues that inevitably come up. The sales support was simply non-existent in our opinion. Any problems that we found with the scales that we received were basically “our problem” once we had purchased the scales. So, at that point we made the decision that there are better products in the marketplace to offer our customers and most definitely better manufacturers to work with. In conclusion, there is no doubt about it, the Torrey LPC-40L is a great deal at least when it comes to up front costs. However, based on our experiences there are certainly better quality scales in the marketplace and there are certainly better scale manufacturers in the industry to work with. Now things may have changed over the past few years, so who knows maybe Torrey is a great company by now. But in our opinion, if you are looking for a good high quality scale to use at the farmers market or a scale to weigh candy by the pound, we would recommend a different item if you can afford it. This entry was posted in Battery Power Price Computing Scale, Buying Recommendations, General, LCD Display, NTEP Legal for Trade and tagged LPC-40L by Scale Man. Bookmark the permalink.